Its fairly simple to create a UU Models comp card. We created this page to take you step by step through the process. If at any time your need help don't hesitate to reach out to the staff around you or email accounts@unite-unite.com or even call the accounts department. To begin, download the models current comp files or the template PSD files located in in his or hers UU DropBox folder. All comp related files are located in the models COMP FOLDER. Within this folder you will see a "Photoshop files" folder. Here you will locate the working comp files. The front file should look similar to the image below. The models height, name and photo are the only items you should need to alter. In rare cases the contact information for Unite Unite will be adjusted. Note: The trim lines located an 1/8” around the boarder. Please make sure nothing important goes beyond this line as it could be trimmed off at the printer. The FIRST NAME is in all caps & Bold 20pt The font is “Didot” smooth. Highlighting the first name and then adding the new name works well. Height is “Proxima Nova” 8pt. Left image is 5.75” tall x 4.5” wide. It can be narrower if your image demands it. Proof the card very carefully checking the models Name, Measurements and Unite Unites Contact information. Send a screenshot to someone else to look over too. YOU WILL BE SAVING 3 VERSIONS OF THE FILE. A PHOTOSHOP PDF NON COMPRESSED. 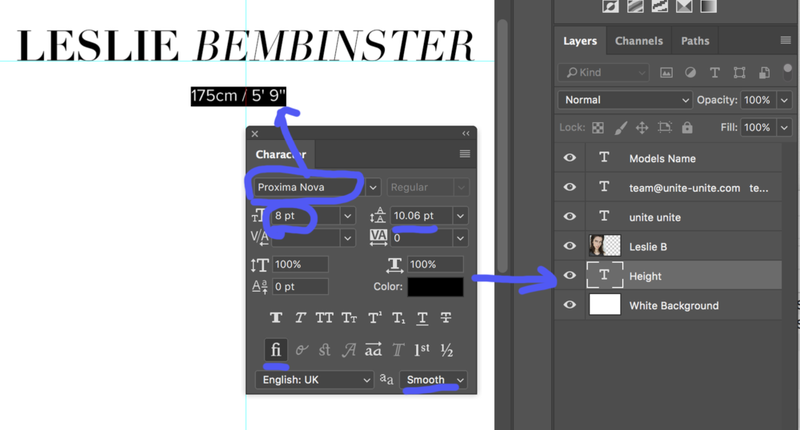 Name the file using this sample name as a guide “Leslie_Bembinster_Comp_5_5x8_5_inch_cut FRONT_07-10-2017” Adding the date prevents you from saving over the older comp file that we wish to archive. PLACE THIS NEW FILE BACK IN THE “PSDs folder located in the models DropBox Comp folder. Make a JPEG file by flattening the layers and saving it in the JPEGs Comp folder. Do Not Compres. Select a high res image cropped to 5.75” x 8.75” @300 dpi. Change the Name using the same fonts as used on the FRONT. Use the “Name” Layer to do this. You can highlight the first name and then type it in. Be sure it all caps. Do the same for the last name. The name sits on a 65% screened back white bar. Please do not change this value unless your check with the Operations Manager or Director. The font for unite unite is Proxima Nova. The UU logo can be moved around to best balance with the image. Choose the version that works the best as far as color: white / gray or gray / white. Copy and paste the models states from the their current MediaSlide info page. Please double check that they paste correctly into the line under the models name. If the stats are to long you can remove the EU and UK sizes. Please place a dot symbol “•” between each stat. You can type this symbol on a Mac by clicking the “alt” or“option” key an the number “8” key at the same time. BE SURE TO SAVE THE FILE in the same 3 formats as you did for the FRONT. Name the file using this format as a guide “Leslie_Bembinster_Comp_5_5x8_5_inch_cut_BACK_07-10-2017” Adding the date prevents you from saving over the older comp file that we wish to archive. Once in bridge, navigate to the JPG Comp folder Select the Front JPEG file and rotate the file so they are both horizontal. With the Back file to the left of the FRONT file. See below. Select the preset Template “TEMP COMP”. If you need to set this up on your system, note the custom settings highlighted in blue. You should be able to print this pdf on one sheet of 8.5”x11” paper and fold in the middle to create a temp comp. You may need to trim the left and right side. If you have any questions or recommendations please feel free to contact accounts@unite-unite.com or call the accounting department fore immediate assistance.